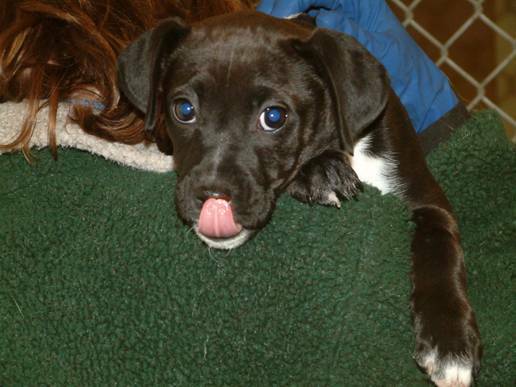 Will You Be Our New Forever Family? She is on death row to absolutely no fault of her own and how with an overcrowded shelter, she is scheduled. Her eyes tell you that she's hardly had a chance to yet experience what the world is even like! 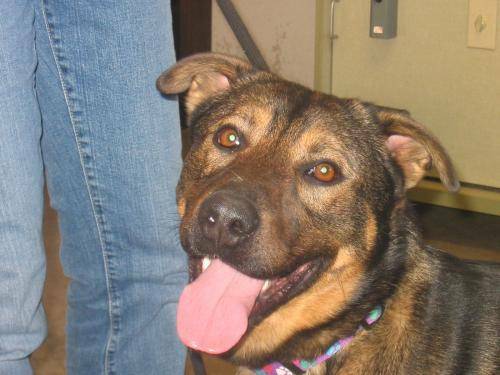 Shayla is only 13-months old, and so deserves a chance to live and love and be loved. What a warm home, attention, play time, even another dog, can do for her. PLEASE let us know if you can foster her or are interested in adopting her. We can send you the application if you don't already have one with us. Shayla and the rest of us would be ever-so grateful. In truth, we have six total but so as not to overload your computer, we are sending along the beautiful Cassie and handsome Tucker. Both are slated to die on Th. unless we can find loving foster or homes or them. Cassie is a love bug. 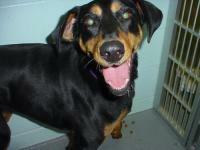 She is a 6 yr-old Doberman mix girl that was dumped at the shelter because her people had no time for her. Boy, that isn't her fault and now you can be guaranteed of a dog that will have undying devotion to you and sink in all the love you can give her. Tucker is just a young, innocent boy. 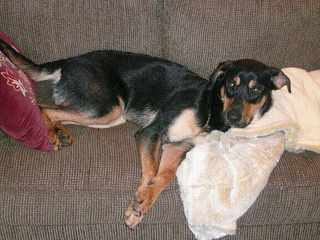 Of lab mix, this 1 yr-old faced the same challenge as Cassie - owners with no time. Geez, that isn't his fault, nor should he die because of it. A great temperment too and aiming to please and snuggle with you. 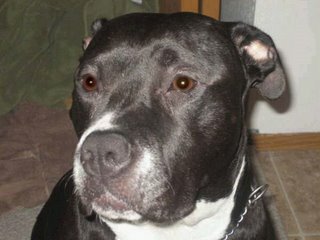 Can you or anyone you know take Jake for a little while to get him off of Death Row? I only weigh 19 lbs. I am neutered, up to date with all my shots, housebroken and I love to be around my owner all the time. I need a fenced in yard to be able to exercise. You can call me your little black shadow as I will want to follow you everywhere you go. I did not have a very good life and I was scheduled to die at the Tennessee Shelter. A wonderful foster mom came along and saved me. I need to be in a home with no kids. I get along with most dogs but the bigger ones I prefer not to be around. I ignore cats and love all the attention that I can get. I am sensitive about being touched around my behind because I was kicked and abused a lot. I need lots of love & someone to show me how to trust again. I promise you that I will love you unconditionally if you should choose to give me a good and safe home for the rest of my life. KCAS has a shepherd/heeler mix, approx 4 years old with 3 - 3 1/2 week old puppies. She was found during the snow without any food water. She gave birth to 3 puppies but seemed to be having breathing problems. An xray showed another puppy still inside. She had a c-section but the 4th puppy didn't make it. This dog has been at the vet for 3 weeks and they are looking for a foster. Right now, she's aggressive with other dogs and cats but Lori believes she can overcome this because she listens. She had the dog near another dog and became agressive - Lori told her to stop it and she did. If anyone can help foster this dog, please call Lori at 206-403-8027. Please Help Keep Us Off Death Row! I am a wonderful 9 year old male Dalmatian. I am black & white, up to date with all my shots, neutered and I am ready to move into my new forever home. I weigh 75 lbs and love to play with other dogs. I can NOT be around any cats as I love to make a game and chase them. I am kind, gentle and very loving. I want to be a couch potato and an indoor dog only. I love walks, riding in cars and doggy parks are my passion.I can not be left out in the cold and prefer the fireplace to stay warm and dry. I get along great with kids and people of all ages. I am smart, knows all commands and I also get along with livestock as well. I will make a loving indoor companion. 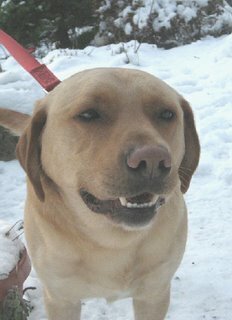 I am a 2 year old Golden Labrador. I love to play and run all over a fenced in yard. I love kids and a family would be so ideal for me. I get along with other dogs, cats and people of all ages. I am housebroken, know some commands and am learning something new all the time. 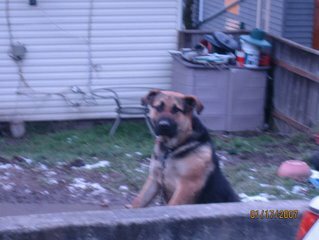 I was an neglected dog chained up in a garage all the time. I wish for a loving forever home. I would love to be in a home with other dogs to play with. Please email Ginger ginger@gingerspetrescue.org and tell her you want to meet me. I promise you will find me to be a wonderful dog and a great addition to your family. 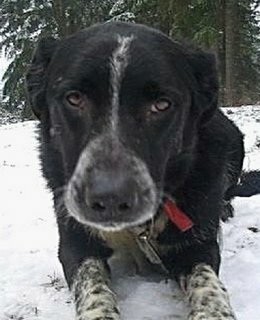 I am a 4 year old male Border Collie Mix. I am loving, friendly and I love to play outside. I get along with people of all ages, kids, dogs, cats and everything under the sun. I love to go on walks, doggy parks and hikes. I am housebroken and I walk well on a leash. 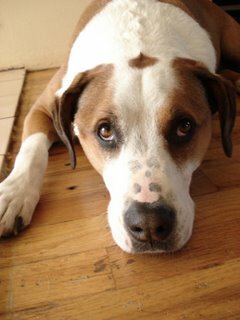 Please email ginger@gingerspetrescue.org and lets meet and help me find a forever home. Thank you to Frankies angels! Guess who got rescued today and terribly needs a bath? Please keep this gorgeous hunk in mind for adoption or foster in a few weeks. 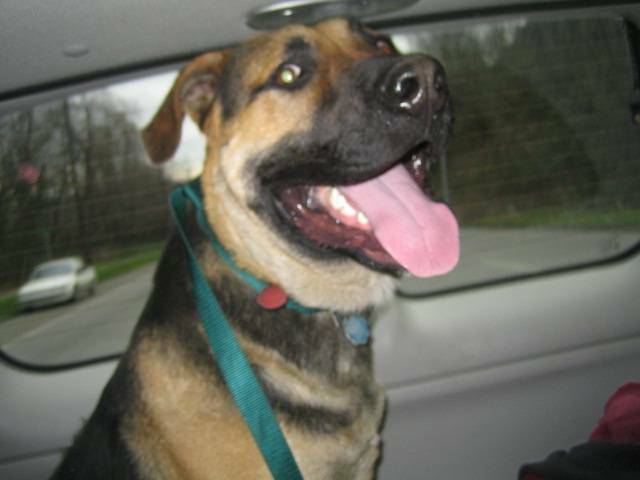 He’s big and playful and just needs someone or a family that will love him and treat him like they love him forever! He’s been through enough. Well behaved in the car. Thanks for everyone’s support! Get ready to take action, Washington animal advocates! With your help, we can put an end to breed discrimination by insurance companies. A hearing on HB 1105 is scheduled for a vote before the House Insurance, Financial Services & Consumer Protection Committee on Thursday, January 25, at 8:00 A.M., so it is urgent that you let members of this Committee know that you support this humane legislation that will protect responsible dog owners. Please contact your legislators today and urge their support of HB 1105. And thank you so much for caring about animals. This is sweet, little Violet. She is young, full of puppy breath and soft hair. Precious, and homeless. 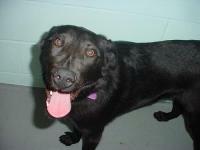 Violet needs a home very quickly, and a foster at minimum. 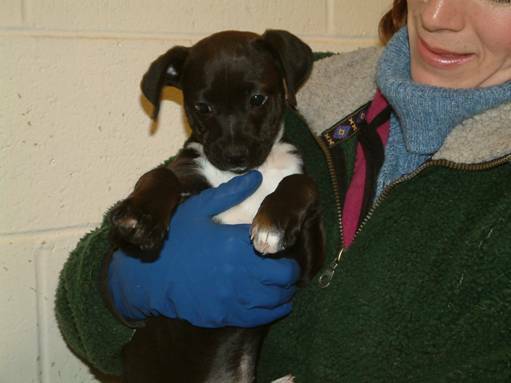 This beauty is a terrier mix, we believe with possibly Boston terrier in her. She needs to live with someone who loves to have a puppy around and is willing to teach her how to go outside for her girly bathroom duties (she has a headstart and can pee outside most of the time), and give her lots of love and toys to chew on. very playful. Small adoption fee. Jeanie needs a home. I met this dog yesterday and loved her. 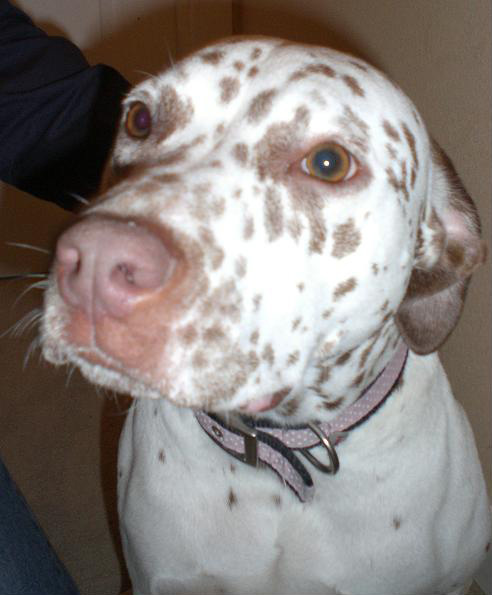 She's Dalmation/Pit mix and very, very social with everyone. 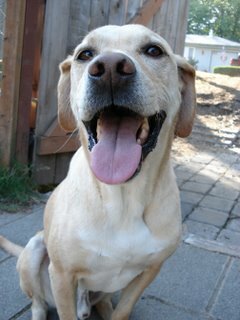 She's from the Humane Society near St. Helens and will be here only until Monday. She's at Erica and Bob's house in University Place and they can be reached at 253.460.3224. As I said, they will have her only until Monday, so please call if you have any interest or quickly send this around to anyone who might be interested. I am THRILLED to announce that there is a guardian angel for this dog. She is willing to assist with the actual rescue, offered to pay for temperament testing and has lined up a foster home 10 days after that. Just in case, let me remind those possibly questioning the legal issue here. They are NOT suppose to have a dog and they have broken their lease. Whether we rescue the dog or not they informed me it HAS TO BE REMOVED, which means they would’ve called Animal Control since the tenants REFUSE to give it away. They have been informed verbally and via letters long before I stepped into the picture. Now something has to be done because the property is being renovated. Let alone the dog being abused! If you could help with finding a PERMANENT loving home for this handsome guy (I think his name is Frankie) it would complete things. I will monitor progress until I am comfortable that it is in a permanent, loving home. If you are interested or know of someone, have them contact me and I will get reports of his progress. Thanks again to all of you that help care for these babies. 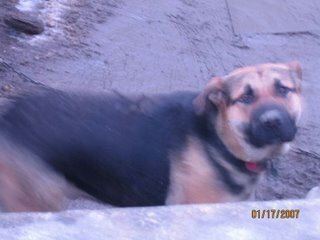 This poor dog lives in this horrible place and is in need of a foster or permanent home before being rescued. I have obtained permission from the landlord to remove it (it’s urgent as there is a deadline regarding the property) and they are working with me as much as possible. However, I’m in a dilemma of finding a place for this dog in time. It is a large dog and very friendly. It is craving love and attention and has attempted to leave these people only to be returned to them. So it is now chained up. The owners have been seen hosing it down during these cold spells we’ve had for entertainment and raising a stick to hit it. They do not pet it, walk it or even talk to it. It’s hard to say why they even have a pet. I took these photos and the conditions are an improvement from how they were before – thanks to caring neighbors. But it’s not enough. The dog was shocked at the small amount of kindness I offered it which is captured in how it looks at me in the photos. He was barking when he first saw me and warmed up within a minute to my efforts to befriend him. It didn’t take much to win him over. I would like to give special thanks to Carina for taking the time and giving herself to helping these needy animals. They deserve so much better! Lets all try to set an example of what it right. How you treat an animal is a direct reflection of your character! 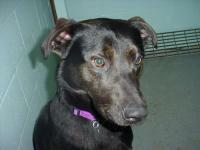 What a sweet girl... “Baci” Black Lab/Rott mix 1-year-old, female. There is always a dog in need! Here is another pup that needs a home. Perhaps Jessie will have a better ending. 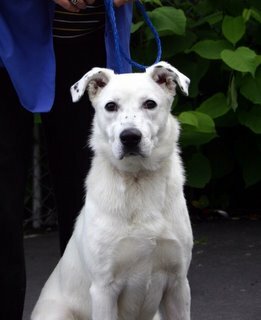 There are two volunteers at Tacoma Humane Society that do nothing but find rescue outplacement for the dogs in need there - they know pretty much everyone (we just took a dog from them today, last year we took 17). They contact breed rescues very promptly, I believe. This shelter is ALWAYS overcrowded but the volunteers make huge efforts to get any dogs out that can be. The shelter is keeping dogs quite a lot longer these days, too, so most dogs end up staying there MUCH longer than is good for their mental health.... The 6 dogs we've taken from them in the last two months were all there 3-6 weeks and they were all over 13 years! What I wish is that people looking for dogs would give one of theirs a chance -- it's hard since they know so little about the dogs, but it's really the only way to deal with this large-scale. Most of us in rescue have about 20 more dogs than we can really handle/pay for! 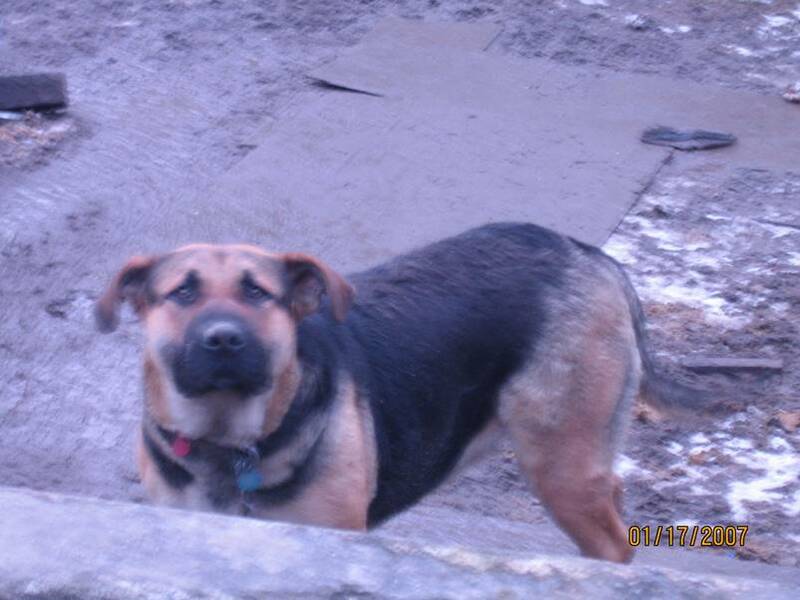 As an example, there is a dog called "Buddy" (actual name is "Bubba") on their Petfinder list who desperately needs someone to look past the exterior and take on a nice quiet friendly dog. He's 7 so too young for our program, not pretty, black, etc. 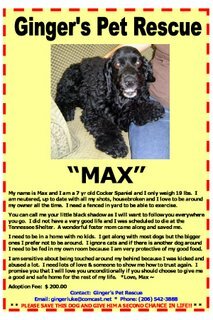 but he's a surrender with very normal bloodwork and good health, a decent behavior assessment, would make a great friend but has little chance at all. Spread the word that this guy (and many like him) need a home -- if every dog lover took on just one extra dog that isn't just perfect on first look, the problem would be solved. This fellow never got to see his home. He went to Doggie Heaven. We are so sorry to hear that. It is what happens when there is no one to adopt or the owners are never found. To whomever owned this wonderful fellow, so sorry for your loss and worry. The only silver lining is his sadness is now over. Too bad it could not have ended better. My heartfelt sorrow for this story. LOST DOGS, HAVE YOU SEEN US? I cam across a wonderful couple a few months back. They lost their dogs. I was in Mud Bay in Kent and this lady came in with a very sweet older dog and we got a chance to say hello and speak for a moment. As we are leaving and I am trying to load Serch and Zappa back into the car, we had a chance to talk a bit more. Strange story but it seems that their dogs were taken from them and ended up somewhere else. This couple spent a considerable amount of time and money looking for Hooney, a Red Male Miniature Pinscher and Twiggy an Italian Greyhound Terrier Mix. Finally after all the efforts of canvassing the neighborhoods, putting up flyers and looking in the local shelters, they got some help from a pyschic. They were told that their pups are fine and living in CA. The boy goes on road trips with the dad as he is a truck driver and Twiggy stays home with the wife and kids. The dogs are well treated and loved but are confused as to what happened to them. 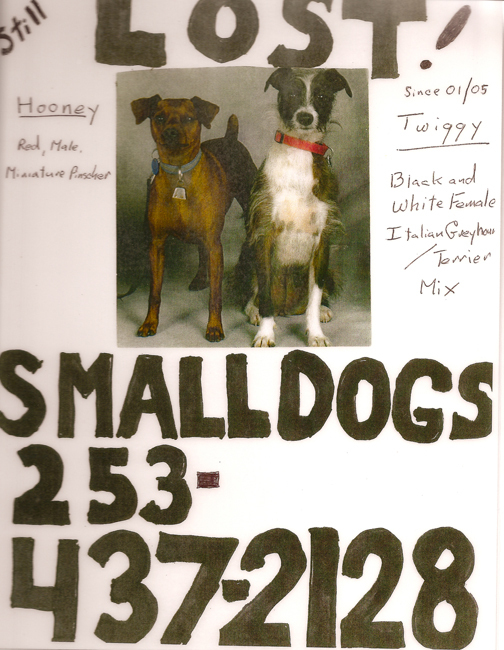 If you have any information on Hooney and Twiggy, please contact the number on the flyer. Please help put to rest, once and for all, what happened. I was not aware that this was such an issue. Dogs being stolen and sold to others. 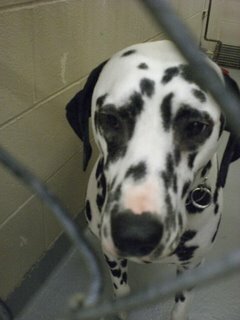 With all the dogs in shelters that need to be rescued, who would take a dog from someone who loves them more than life? Perhaps instead of stealing dogs out of cars, yards and good homes, help find good homes for the dogs in animal shelters. It was so visible, the heartache of this couple who just want to know what happened and perhaps be so lucky as to get Hooney and Twiggy back. I could not be more proud, even after all that sorrow they adopted again and again, helping other dogs win the doggy lottery! Again, if you know anything, please call! There could be no better gift to be received than knowing what realy happened and if their babies are safe. "Won't you love me and take me home today?" Bo was dumped and abandoned by his owners and was found extremely depressed. He was saved just one day before he was scheduled to die. 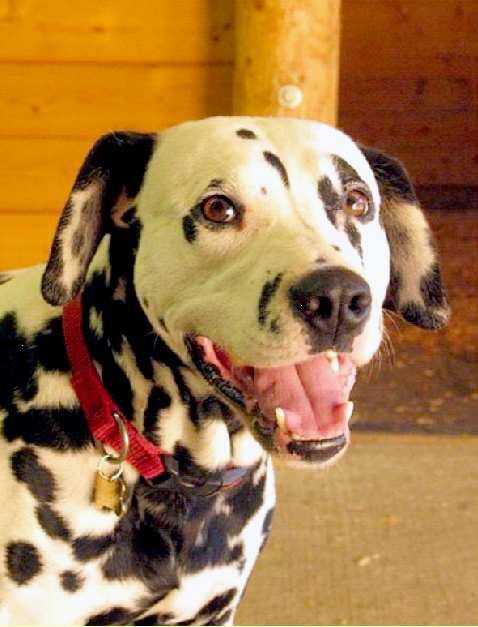 At 12 years old, Bo thought he would never be claimed or loved ever again. A vet's office claimed him until a wonderful foster mom Laara decided to take him in. Now Bo desperately wants his forever home or a new foster home. Bo is a wonderful 80 lb German Shorthaired Pointer. And he loves to point at the Ducks at Greenlake! He gets along very well with other dogs, cats and children. He is very, very sweet, housebroken and just one super neat dog. He has a little bit of arthritis in his back legs but he still loves his exercise and daily walks. I have supplements that can help Bo with his legs. When I first met this dog, he was so calm, loving and so adorable. I was extremely impressed with his easy disposition and his eagerness to please me. 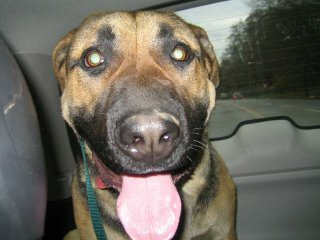 Can anyone make Bo's New Year's a GOOD ONE and adopt or foster this dog. 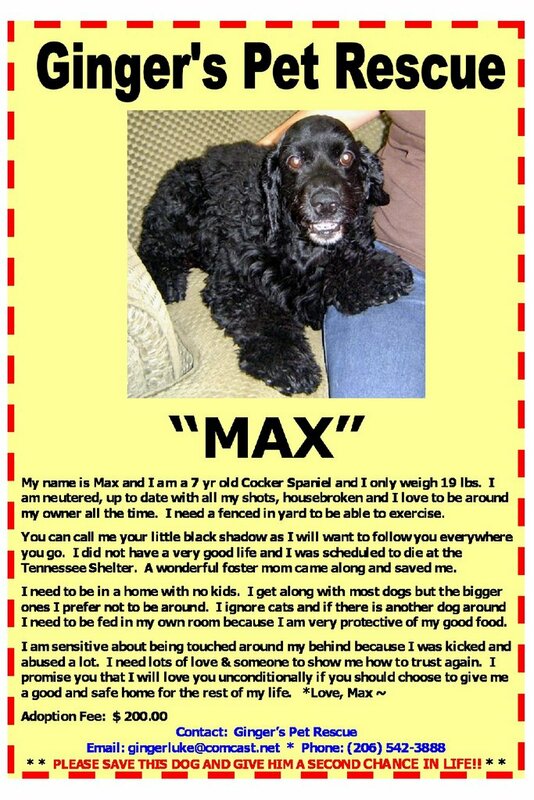 This is urgent so please forward this dog to everyone you know. As you all know that Senior Dogs have a very special place in my heart !! The AC picked this dog up in Gig Harbor on Thursday. This boy is in excellent condition and could be a show dog. 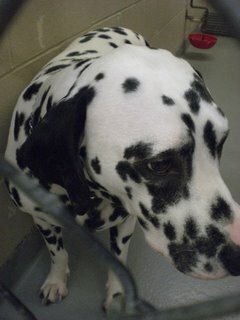 But he has become very very nervous and upset in the shelter! This is NOT a good sign! Dals DO NOT do well in this environment! The longer he is in there, the less likely he will pass a temperament test!!! And we all know what that means!! We are BEGGING for someone to please foster this beautiful boy while we look for his family! He cannot stay in the shelter!! PLEASE KEEP REPOSTING! Do you know his family? Do you know someone who can foster him? He is in danger if his family does not come to claim him!! Please someone take this boy to safety!! Hello to everyone. Today is the first of 2007. I hope this year allows us to grow and save more animals with your help. We appreciate the support we have received this last year from everyone! Thank you so much!! Zappa says thank you all. Our big and special donation this year was in large support from the help of our neighbor Bev and her network. We gave blankets, towels, washcloths, leashes, collars, harnesses, crates, food and of course Uneek Treats to our local Kent Animal Shelter. We are big fans of our local shelter. They took in Serch and we found him there just waiting for us. This year we would like to be able to do more in helping foster and find forever homes. We would like to start an email community that can take these requests and help get them out to as many folks as possible. You never know who is ready at what time to help open up their home and lives to a needy animal. If you would like to be part of that community, please email us.